It’s hard to tell exactly what makes a burger so perfect. Maybe it’s the delicate ratio of meat, condiments and bun, or possibly the creativity that comes in the form of toppings. If you’re looking for those ideal ratios and delicious toppings, Iowa’s best burger joints have it. Here are the 10 best in the state. In contention for the “Best Burger in Iowa,” BW’s Burgers out of West Des Moines serves up a variety of hamburger concoctions for you to enjoy, plus your choice of steak, cheesy or specialty seasoned fries to accompany your meal. All of BW’s burgers are 14 ounces of meat grilled up to perfection and served how you like it, and whether you order something with the traditional condiments, or you go for something a little more unique like a bruschetta burger, you can expect a better burger at BW’s no matter the meal you’re enjoying. While Elms Club in Creston has a great reputation for the perfect burger, in combination with the many other menu items to choose from, and the sociable space that tends to draw a crowd, Elm’s Club is proving to be much more than just a simple burger joint. While the burgers are a must-have, on your fourth or fifth visit it might be worth your while to sample another entree item including the grilled pork loin or the Philly cheese steak. If you like your burger bigger, then Teddy’s Bigger Burgers in Iowa City has the right recipe for you. Featuring a Hawaiian-themed menu including Hawaiian style burgers complete with Teri sauce and grilled pineapple, as the name applies, Teddy’s serves up their burgers big to satisfy your appetite. Whether you stop in the friendly storefront at Teddy’s for a quick original, or you sit down with a side of fries, after one bite of a bigger burger, you’ll know it won’t be your last. The Chuckwagon Restaurant in Adair has something for every meal of the day, ranging from breakfast fare to burgers and cold beer plus dessert, and whatever the food you and your family are hankering for, the Chuckwagon can cover it in their fun and friendly restaurant space. 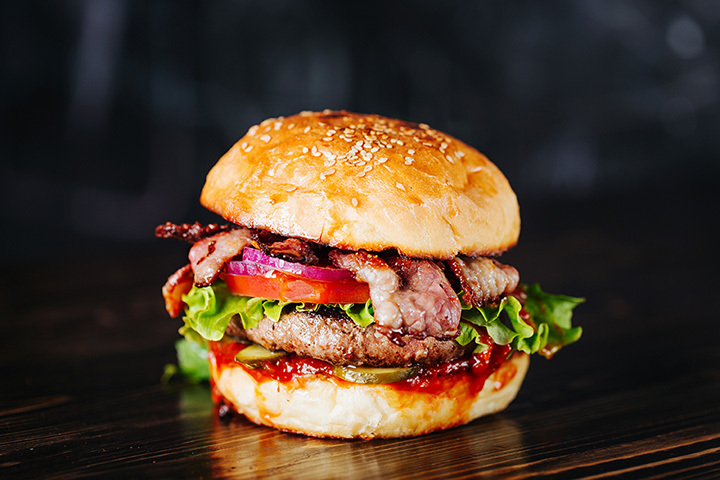 While every one of the menu and beverage options are worth the visit to the Chuckwagon, it’s their burgers that are the piece de resistance, and with all the original and classic burger varieties to choose from, there’s loads to try at the Chuckwagon in Adair. Ankeny Diner on Southeast Delaware Avenue is the epitome of the classic eating establishment. Featuring all the diner menu classics including breakfast plates, turkey clubs and of course, burgers and French fries. You can decide upon original burgers at the Ankeny Diner, or you can go a little more adventurous with something like a Goober Burger with an egg cooked to your liking plus cheese and peanut butter. Whatever lunch or dinner option you opt for at the Ankeny Diner, know that you’re ordering up a meal you’re going to enjoy. Nothing quite pairs with a burger better than an ice-cold beer, and at Beer Burger in North Liberty, those are the two secret ingredients to all their success. Featuring an extensive tap list and first-class flavors of burgers to choose from, the combinations that equal a good time at Beer Burger are nearly endless, and with so much to choose from and so many flavors to entice your taste buds, one visit will not be enough to get the entire Beer Burger experience. Featuring gourmet burgers and sandwiches, plus hand-cut fries and specialty sides, Saucy Focaccia in Cedar Rapids rises above your average burger joint. Coupled with an inviting atmosphere, Saucy Focaccia serves up a wide variety of burgers including bacon mac & cheese and hot mango tango, plus a long list of sauces to top it all off. Also in contention for the Iowa Meat Council’s best burger in Iowa contest, see for yourself why there is a good chance that Saucy Focaccia will be bringing home the gold medal. Down Right Delicious in Clarinda is a combination of a bakery and cafe, and whether you want something sweet or something savory, this hometown favorite eatery serves it up hot and fresh. Featuring a full breakfast menu and an endless combination of burger toppings, Down Right Delicious lives up to their name with all the entree options that welcome you on the menu, including the burgers that are giving this small shop quite the big reputation. If the undead were ever craving something other than human meat, chances are you would find them at Zombie Burger in Des Moines. With other locations in Iowa City, Coralville, Ankeny and West Des Moines as well, Zombie Burger serves up an assortment of cleverly named and flavored burgers including the Dead Moines with smoked gouda, prosciutto, ham and truffle mayo, plus a long list of alcoholic and non-alcoholic milk-shakes to really satisfy your appetite. A lot of the menu options at Zombie Burger might also include a take-home box, but when you find yourself shuffling through your home later with burger on your brain, you’ll be glad you visited Zombie Burger earlier that day. Perhaps not only the coolest burger joint in Iowa, but also up for the best burgers in the state, Short’s Burgers and Shine in Iowa City is a must-visit burger joint in the nation. With a long list of exclusively gourmet burger options, the interior of Short’s is fashioned from the era of prohibition, giving each visit a stylized feel of older times when the extensive craft beer menu would have been hidden from sight. With over 20 burgers to choose from at Short’s, it will take multiple visits to try everything this established and soon-to-be long-lasting burger joint has to offer.